As part of a bigger deal with ABC that included The Muppet Showpilot, Jim agreed to appear with trumpeter Herb Alpert on his television special for the network. Jim and his team flew to London to tape Herb Alpert and The TJB. 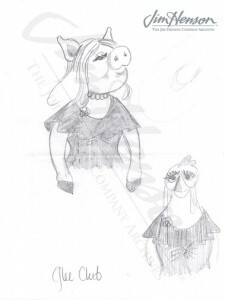 Along with some Snerfs and big Bossmen puppets, they packed a couple of pigs that had been made for a “Return to The Planet of The Pigs” sketch planned for the pilot. Later, these pigs would, of course, populate the recurring “Pigs in Space” segment in the series. On his show, Alpert was accosted by a pushy pig talent agent, performed by Jim, and his protégée, a glamorous lady pig called “Piggy Lee”, performed there by Jerry Nelson. This proto-Miss Piggy had instant charisma and wouldn’t leave the stage without a contract. Her star quality was obvious, and when she reappeared on the series as an attractive glee club member, she was a hit. Though Jerry Nelson performed her on Alpert’s show, Richard Hunt gave her a try during the first episodes of The Muppet Show. But when Frank Oz got hold of her a few episodes into the first season, it was a match made in heaven (or the other place), and his performance gave an unequaled depth to her personality and an unforgettable comic sensibility. 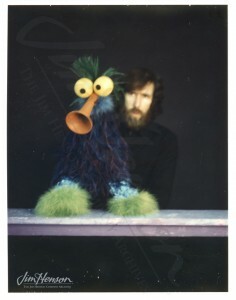 The Alpert special appearance, though made for ABC, had all sorts of connections for Jim that laid the groundwork for production of The Muppet Show. The special was shot at the ATV studio outside London, part of Lord Lew Grade’s company ATV/ITC Entertainment. The floor manager there was Martin Baker who would work on The Muppet Show for ATV and continues to serve as a producer on numerous Henson and Muppet projects including the new Muppet feature film. Dwight Hemion, who had directed the Muppets on an earlier Julie Andrews ATV/ITC special also directed this one, helping Jim feel at home in London. After ABC decided against backing a Muppet series, Jim moved on to pitch CBS and had serious but unfruitful discussions with the network. Abe Mandell from Grade’s company had been pursuing Jim for a syndicated series and, in the end, it was back to London in early 1976 to produce the first episodes at the ATV studio. Jim’s relationship with Lord Lew Grade was long and rewarding, both professionally and personally, for both men. The other Henson connection with Herb Alpert, of course, is the location of The Jim Henson Company’s headquarters in Hollywood. Long before the Muppets’ appearance on his show, Herb Alpert and his business partner Jerry Moss formed the A&M Record Company. In 1966, along with Alpert’s Tijuana Brass Enterprises, Inc. they purchased what had originally been Charlie Chaplin’s movie studio on La Brea Avenue from CBS Television and converted two sound stages and Chaplin’s swimming pool into recording studios. Around 1990, the business was sold to Polygram Records who in turn sold it to Universal Music. 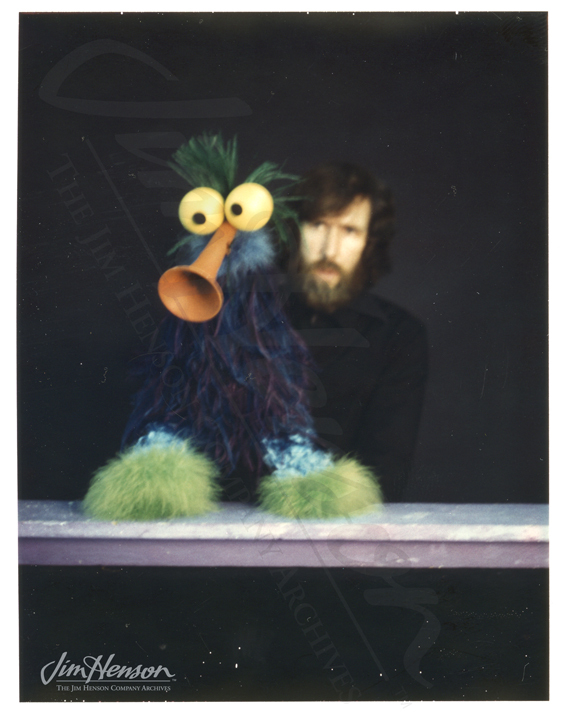 In 1999, the Henson family bought the lot, moving in their production company and retaining the recording studios which are much loved by members of the music industry. Today, near the production of Sid the Science Kid and the workshop for the Stuffed & Unstrung puppets, you will find young artists and rock legends like Mick Jagger making music in the recording studio founded by Herb Alpert. Jim tests out a Snerf during rehearsals for the “Spanish Town” song on the Herb Alpert show. 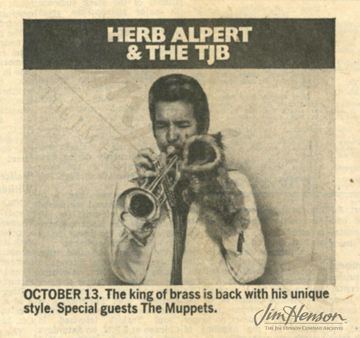 Newspaper promotion for ABC’s Herb Alpert special. Bonnie Erickson’s sketch of glee club members for the first episode of The Muppet Show. 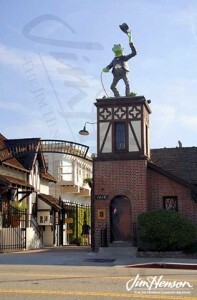 The Jim Henson Company headquarters, former home of Charlie Chaplin’s studio and A&M Records. This entry was posted in 10-October '74, 1974, Muppet Show and tagged ABC, Frank Oz, Herb Alpert, Jerry Nelson, London, Lord Lew Grade, Martin Baker, Richard Hunt. Bookmark the permalink.